Look what I bought (I mean caught)! WHAT THEY ASKED FOR: Jess wanted something special for her boyfriend’s birthday and thought a caricature of him would make a great addition to his new trophy room. Jess may or may not have asked me to give James big muscles and a six pack. WHAT THEY GOT: James almost got a mermaid’s tail – his picture was cut off at the waist and I drew a mermaid tail in the original sketch but removed it from the finished piece. I also toyed with the idea of adding a terminator type effect to his sunglasses for a bit of fun. 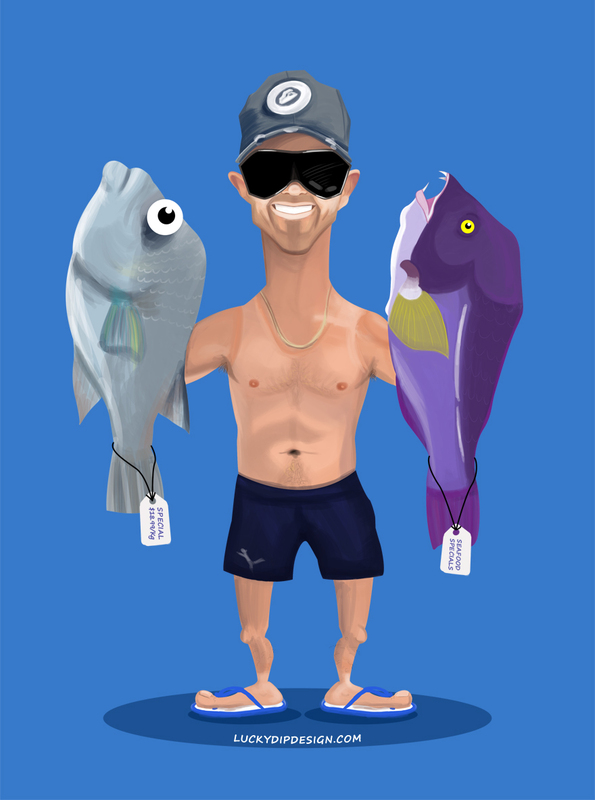 In the end, James gets to show off his tan lines and the two fish he caught bought from the seafood shop. LIKE IT OR NOT: Let me know what you think in the comments below! GET YOUR OWN: If you’d like a caricature of your own, get plucky and enter the lucky dip.